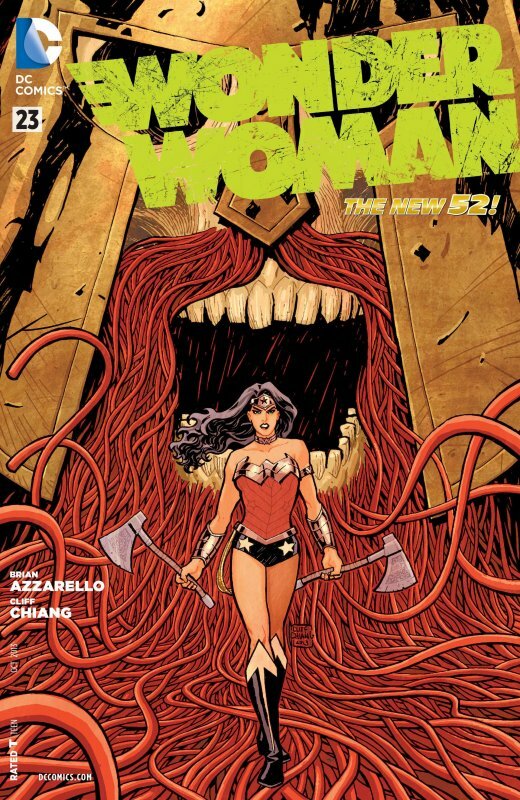 Wonder Woman kills Ares and as a consequence takes the title of the God of War! 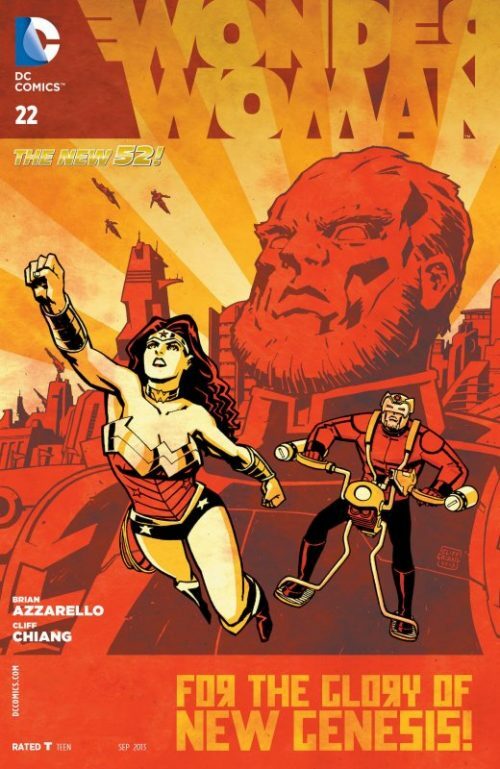 Once again Azzarello lobs a grenade into the status quo! 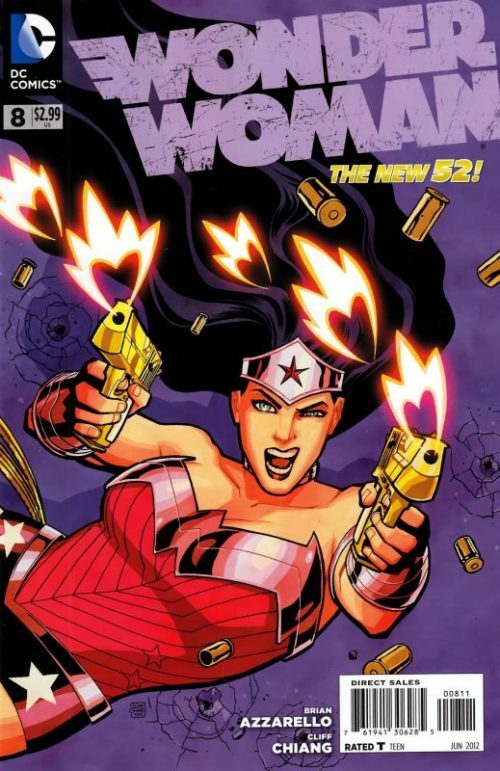 Wonder Woman and her companions have just returned to London from New Genesis, only to find that in their absence, the First Born has laid waste to the city. Faced with the armies of the First Born, Ares begins to shuffle away, tearing down the walls of Westminster Abbey to reveal that he has brought his own army – every single soldier who ever had a song sung about him throughout history. 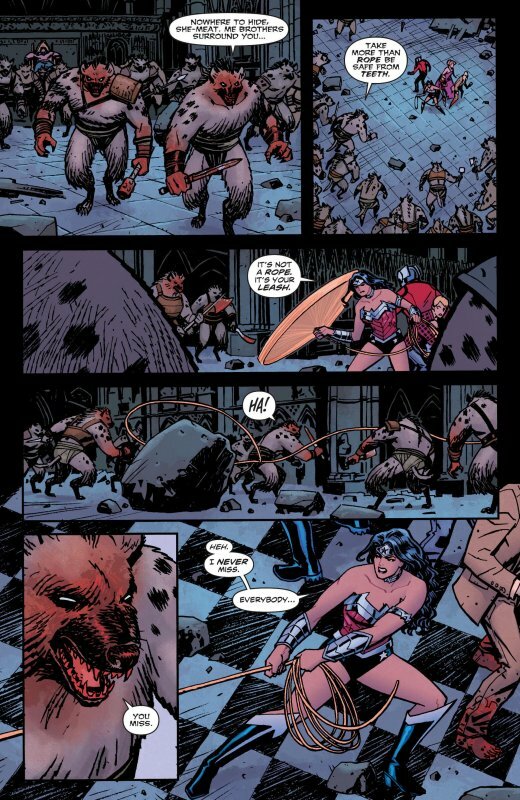 These warriors remind Diana of her lost Amazonian sisters, and Ares admits that these men would probably take that as a compliment. With war breaking out all around them, Hera realizes that she must get Zola and Zeke to safety. They try to run for their lives, but all the same, Zola is sure that her baby boy will see them through it all safely. Orion, meanwhile, attacks the First Born, unafraid of the hulking god. For all his bravado, though, he finds himself crushed beneath a stone pillar. Angrily, Wonder Woman warns the First Born that she will make him pay for what he’s done, and he points out that he can smell her hatred. Ares warns that as much as she might want to avenge Lennox, if she rushes in without any control, she could lose herself. Eyes glowing with power, Diana removes her Bracelets of Submission, which keep her power limited, and leaps at the First Born, launching him into the sky. Relentlessly she punches him, warning that if she must destroy him to stop him, she will not hesitate. He responds that she just hesitated, and reverses their situation, plunging with her back toward the ground, and slamming her into the hard earth. With Diana down, the First Born turns his attention to Zeke, the child of prophecy. 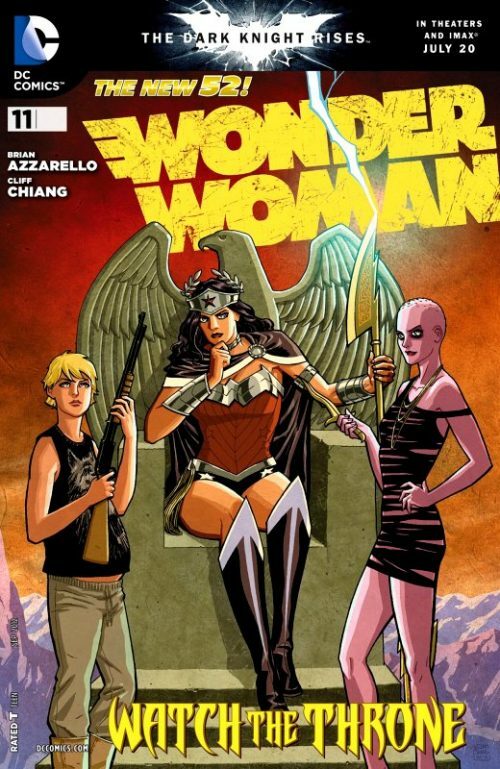 Hera, the First Born’s mother, stands between them, and he becomes angry with her. Angrily, Ares fires a shot from a gun at the First Born’s head to turn his attention to challenging him. 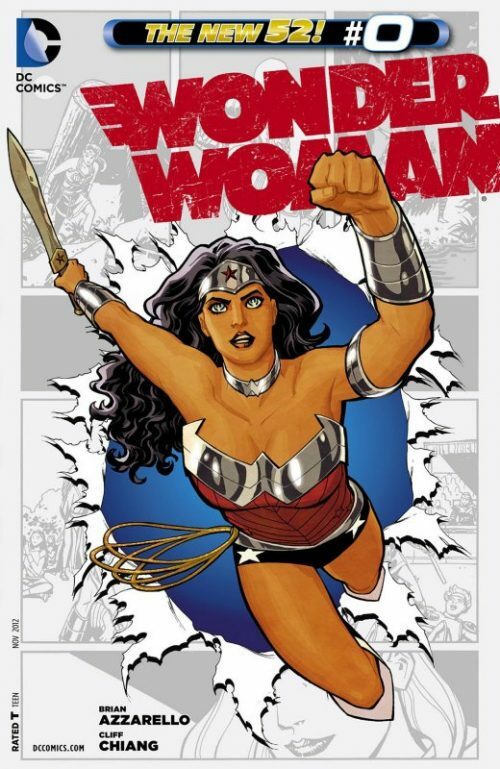 Wincing, Diana rises, and admits to Zola that Ares had been right about her. Sometimes, it is best not to be who one is, but rather who one aspires to be. She collects her gauntlets from the ground and returns to the First Born, watching as he prepares to kill Ares and take his title as God of War. Knowing there is little time left, Diana thrusts her spear through Ares’ back and into the First Born’s chest. As he lies dying, Diana apologies to Ares, but he absolves her, admitting that it was the warrior’s path, and he would have done the same. He apologies, though, for the burden that he must now place on her shoulders. 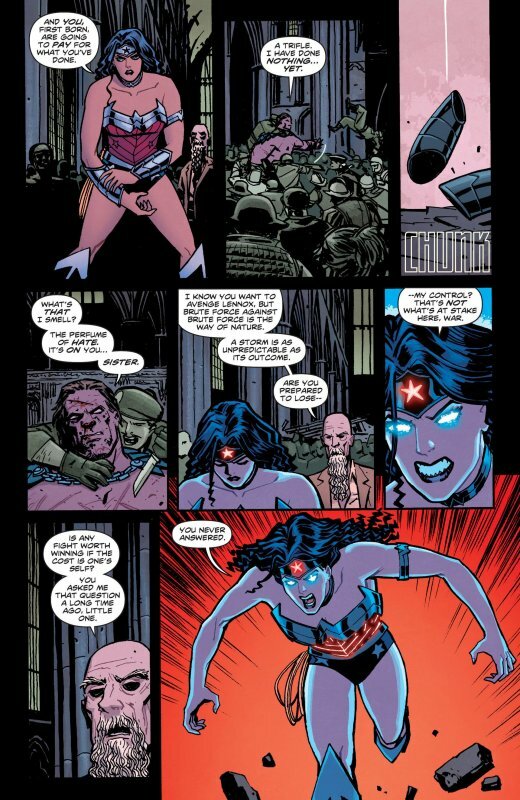 As he dies, he addresses her as Wonder Woman, and asks her to keep him in her heart. Angrily, the First Born attempts to rise up, but Zola clubs him over the head, and he remains down. With War dead, Hades appears, and warns that it is time for Ares to go with him. Sadly, Hera stops him, and begs the chance to say goodbye to her son. She kisses him on his bald head, and wishes him the peace in death that eluded him in life. Diana decides to leave the First Born alive, for now, giving Apollo the chance to take him for himself. Meanwhile, Diana and Hades carry Ares’ body to the ferry, and head down the River Styx to his final reward.